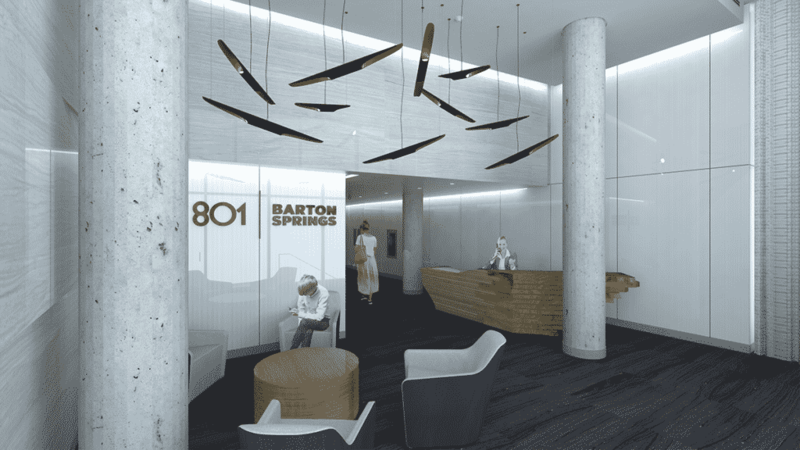 What’s Under Construction at 801 Barton Springs in Austin, Texas? 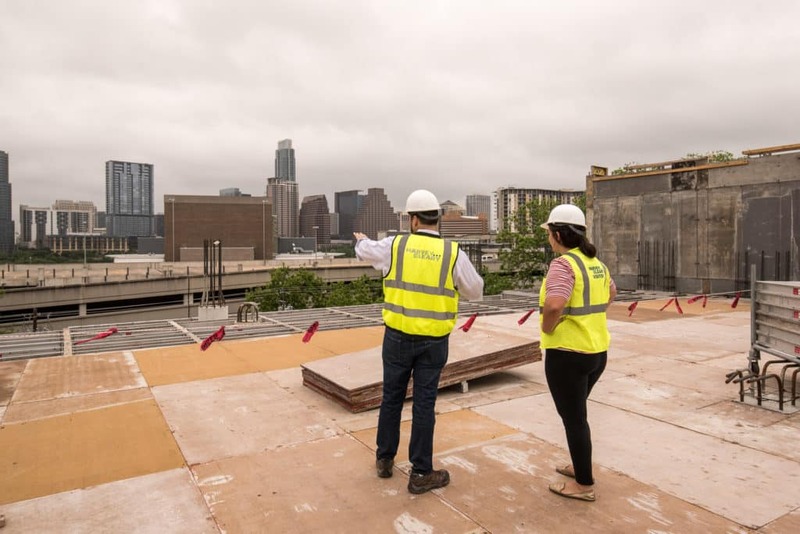 Last week, I had a chance to tour the 801 Barton Springs construction site with developer, Joe Llamas, principal of Generational Commercial Properties. 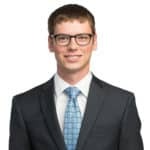 He walked me through the site, gave an update on what is underway and provided insight into his and the architect’s vision for the building as a whole. In the rendering below, you can see what the completed building will look like. The project will be ready for tenant build-out October 1, 2017. Viewed from the outside, the building is an abstraction of a waterfall. The blue glass of the office floors represents the still, peaceful lake at the top of the falls. The vertical panels in the middle, which enclose the parking garage, portray the rushing, falling water. And the white stucco of the ground floor and lobby are the foam at the bottom of the waterfall. The vision is truly coming together at the parking garage level. 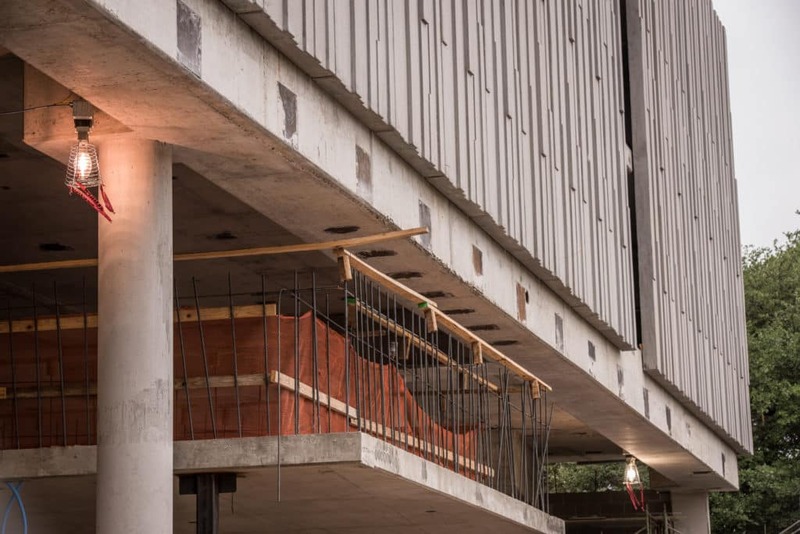 At the time of my tour, the garage was at least 60% enclosed with these custom designed, vertical precast concrete panels. Each panel weighs between 6,000 – 12,000 lbs – that’s roughly as heavy as a large SUV! 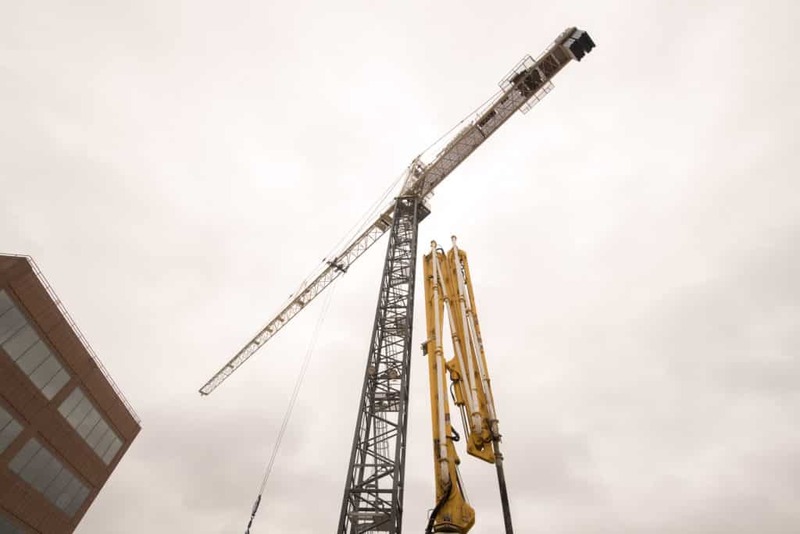 Using a tower crane, the crew can install 11 panels a day. The entire process will take two weeks. 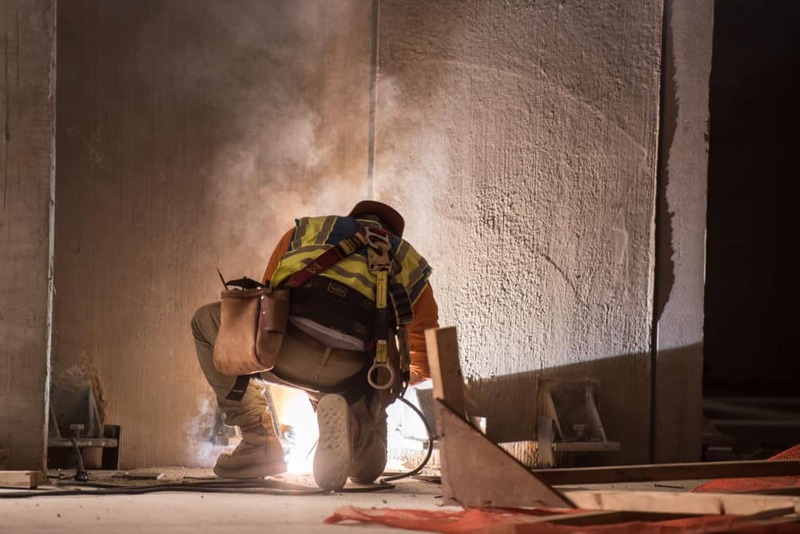 Once in place, the welding team then welds these precast panels to the structure of the parking garage. 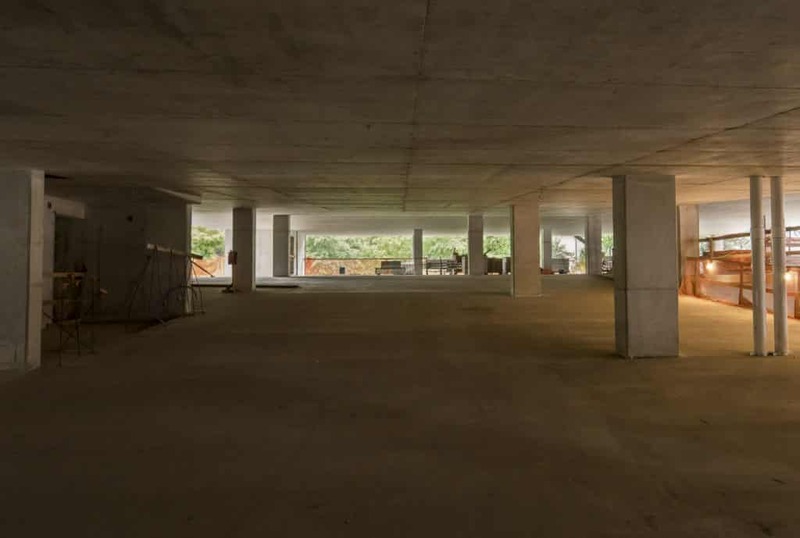 The parking garage uses a post tension concrete structural system. 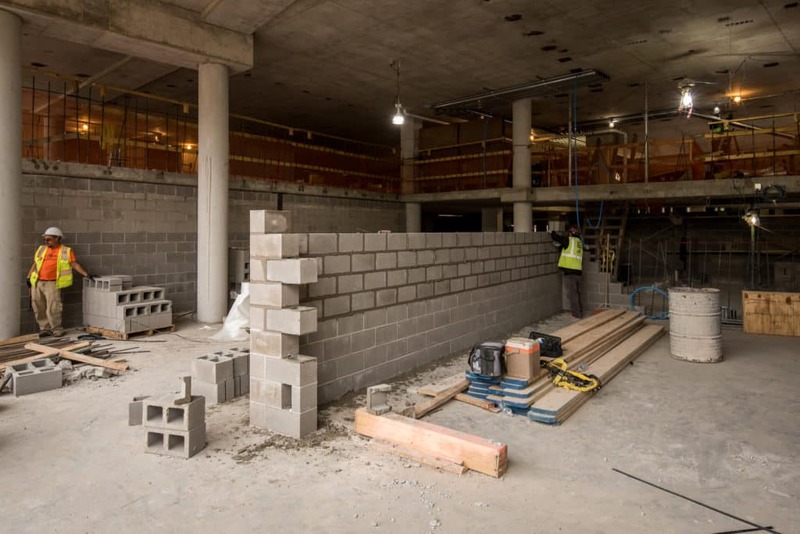 All five levels of the parking garage have been built, and they are now adding in plumbing and drainage. 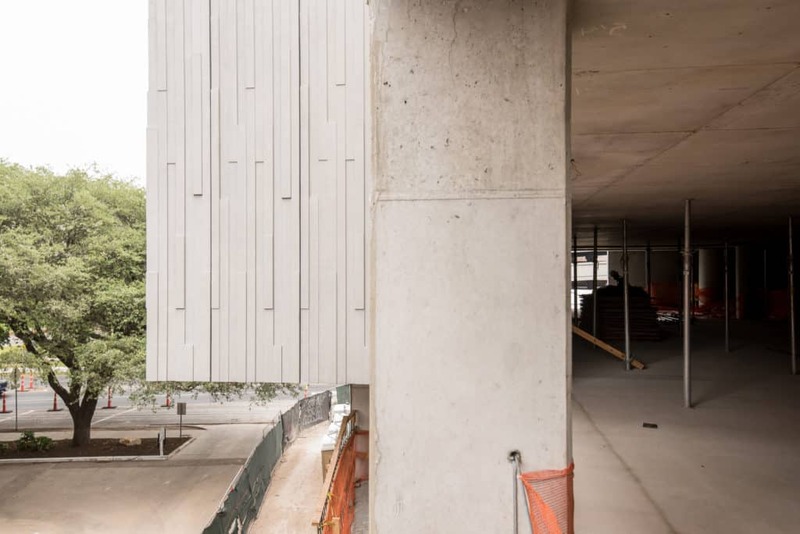 The parking levels will be fully enclosed when complete, with elevator access directly from each floor, ensuring that tenants will never be exposed to the elements when the Texas weather decides to act up. 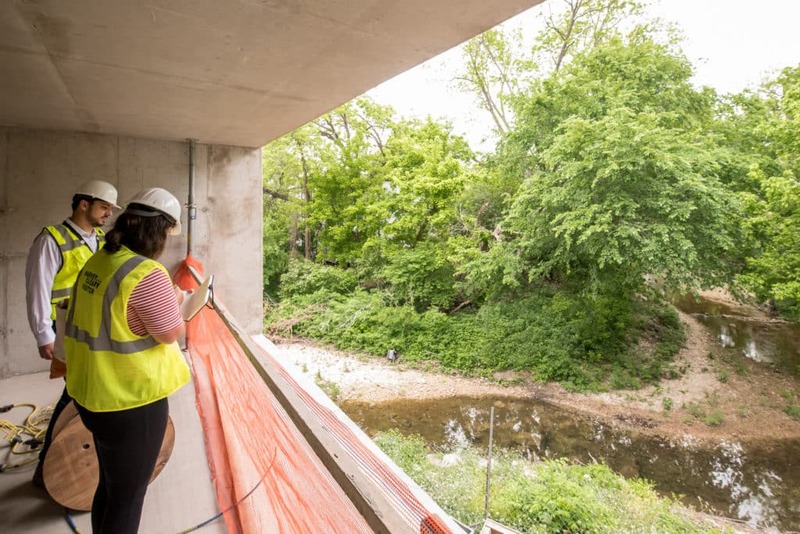 From the openings in the parking garage, you can get a peek at one of Joe’s favorite elements of the building. From one side, you can see the Austin skyline (check out the views discussed later on), the traffic on Cesar Chavez and the urban side of Austin. On the other side of the property, there is a retreat – the site backs up to a creek and will have views out over the hill country and the greenbelt. 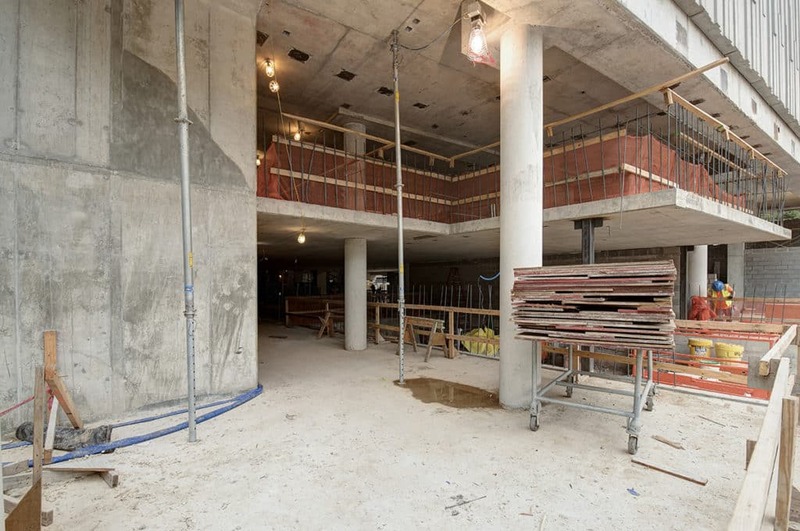 With the structure in place, you can start to see the lobby taking form. Compare the photo and the rendering below. The column on the right is the same one seen on the right of the rendering. When complete the lobby will include walls with a combination of back painted glass and marble while the floors are a black stone. A building directory will be available across from the elevators. On the western edge of the building, the retail shop is beginning to take on its form as well. This will soon be home to a new coffee shop or restaurant on Barton Springs Road, as seen below. One of the projects most interesting features is the series of cantilevers throughout. Seen below is the first of these overhangs, just a small one that juts out to the side of the parking lot. 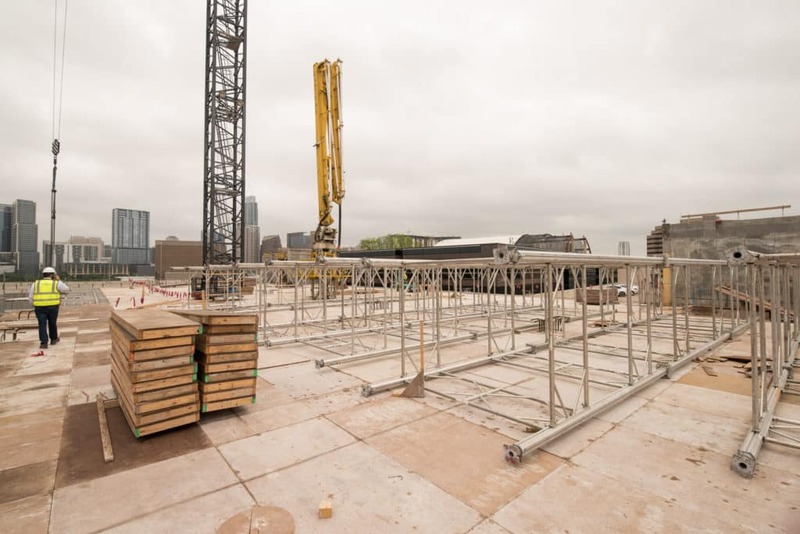 On top of the building sits the scaffolding, on its side, ready to be put to use to support the main cantilever of the building during construction. The office levels of the structure shift, so that they hang off the edge of the parking garage. The scaffolding sits on its side on the roof of the parking garage, ready to be put on end and support the cantilever of the office levels, while under construction. The surface Joe and I stand on here is actually the top level of the parking garage, or the deck of the first level of office. This is where you can start to see how spectacular the views are going to be from the offices. 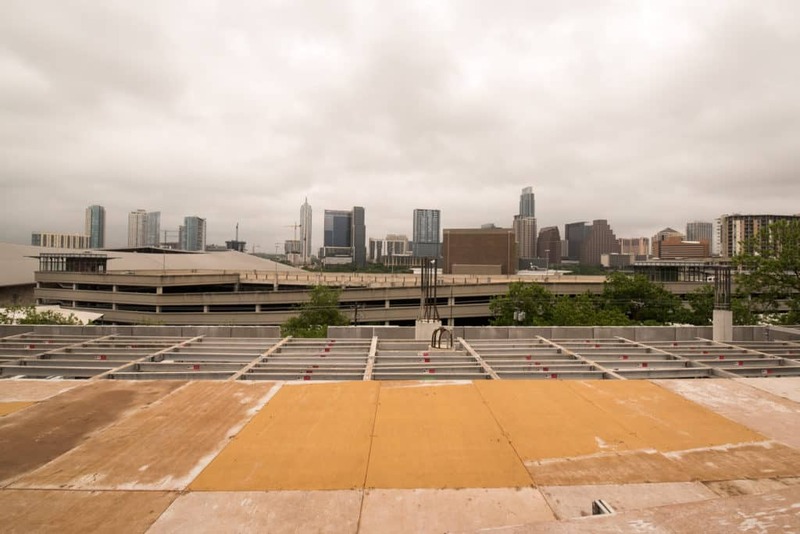 Looking north, the floor-to-ceiling windows will offer perfect views of the Austin skyline. The crane is in place and ready to continue to build the four stories of office on top of the existing parking structure. 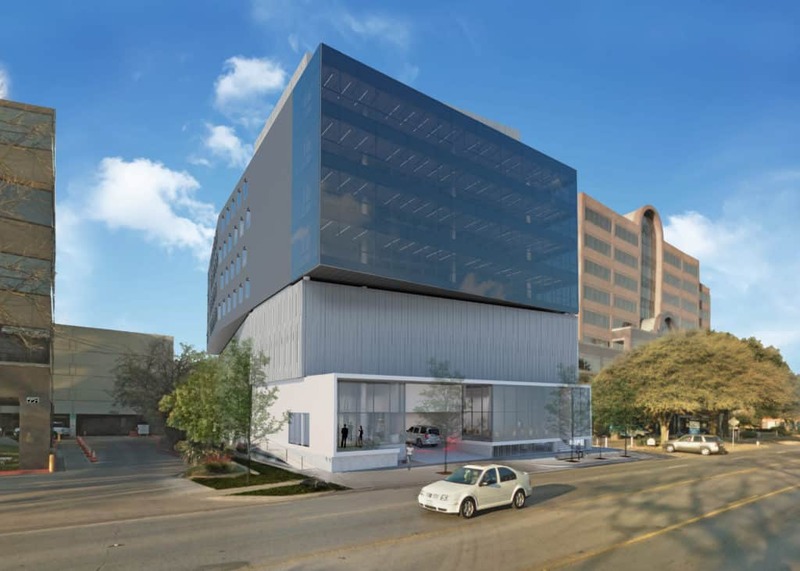 When completed, 801 Barton Springs will feature 90,500 square feet of office, on top of four and a half levels of parking and 1,800 square feet of restaurant space. 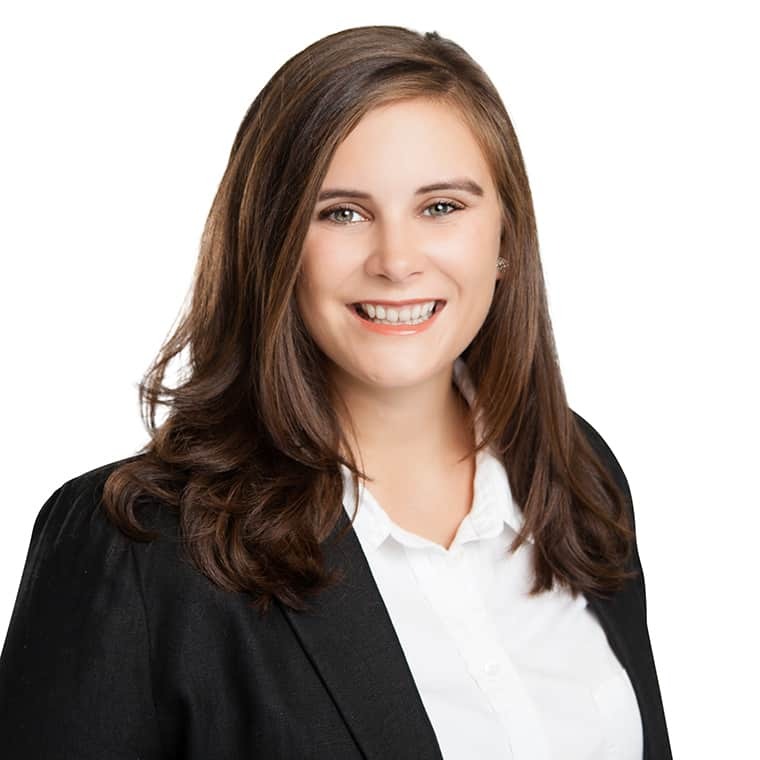 The building is designed to meet LEED standards and, when complete, hopes to achieve silver status. 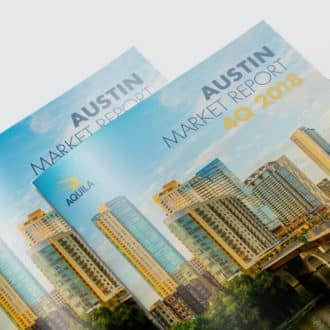 For more information about 801 Barton Springs, visit the AQUILA leasing page or www.801bartonsprings.com.